The Cylinder Transport Unit (CTU4) has been designed to enable staff to transport heavy, awkward oxygen cylinders. Just think, no heavy lifting, back injuries, or disability claims. 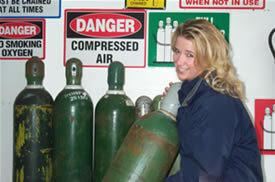 You can now quickly and easily allow your staff to transport oxygen cylinders effortlessly. With over three years of research and development, we know you will be proud to have a CTU4 as part of your team. Click here to read several testimonials from across the country. One CTU4 Does It All! "It's about being part of the solution."